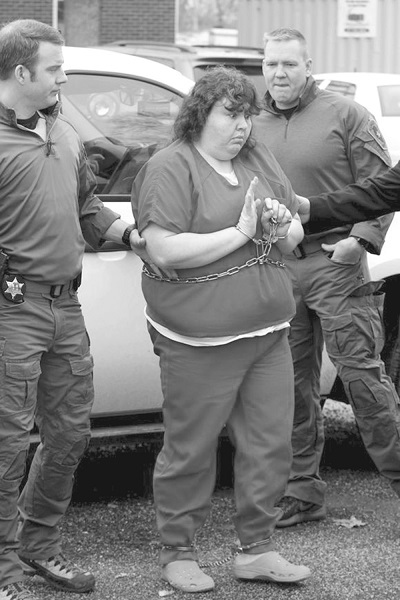 Angel M. Logsdon, 40, Gladstone, is being escorted by Illinois State Police to appear in Henderson County court in Oquawka in connection to the 2017 murder of Rex Mynatt, Sr., Carman. At 2:00 p.m., in Henderson County Court Friday afternoon, January 18, 2019, Angel Logsdon in connection to the Rex A. Mynatt, Sr. murder October 2017, pled guilty to felony charges of "Concealment of a Homicidal Death" in a negotiated plea and waived all of her rights as clearly explained to her by the honorable Judge Raymond A. Cavanaugh. Logsdon was sentenced to 2-years probation, $1,496 fines, fees and costs at a monthly payment of $30 a month, a probation fee of $25 a month, and serve 914 days in the Henderson County jail with credit for 457 days already served. She's required under her probation rules to activily seek a job and keep records, and a list of other probation requirements including not leaving the state without permission, no fire arms, ammunitiion, dangerous weapons, illegal drugs, alcohol, or violation of criminal or traffic laws, and to enter no dram shops. She is to personally appear before a probation office and cooperate fully, and most importantly, testify truthfully in the prosecution of Donny J. Blakley, Jr. and Amy R. Hoffman in the murder of Rex A. Mynatt, Sr.